KeyLogbook. // Digital logging solution. 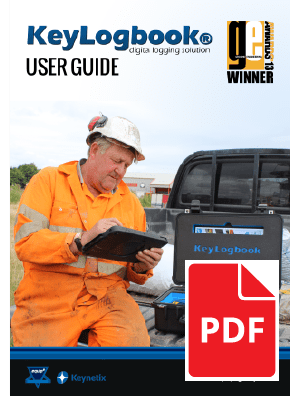 KeyLogbook® is the UK's premier digital borehole and trial pit logging solution for the geotechnical and land drilling industries. Revolutionising the way site data is captured, recorded and transmitted, KeyLogbook will smooth your workflow and save you and your team hours of unwanted and unnecessary paperwork. Drillers and engineers no longer need to keep re-entering the same data repetitively and can instead collect all data in real time, on site.. 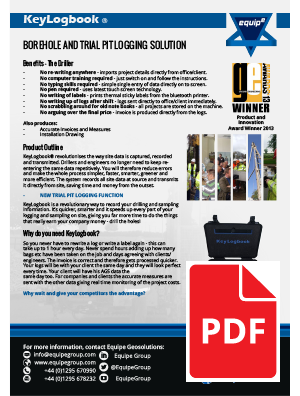 Developed in partnership with geotechnical data specialists Keynetix Ltd, KeyLogbook massively reduces logging errors and make the whole geotechnical data collection process simpler, faster, smarter, greener and more efficient. The system records all site data at source and transmits it directly from site, saving time and money from the outset. Recording an SPT result with KeyLogbook. How KeyLogbook can help you. For years the geotechnical industry has been entirely reliant on pen and paper to log and interpret geotechncial data obtained from ground investigation. Issues of ineligability, lost notes, soaking paper and errors due to data reinput has meant that huge hours of man-power and swathes of money are plunged into something that should be so simple and yet so often proves so troublesome and time consuming. Want to save time, money and stay one step ahead of your competition? Look no further. KeyLogbook is a revolutionary way to record your drilling and sampling information. It's quicker, smarter and it speeds up every part of your logging and sampling on site, giving you far more time to do the things that really earn your company money - drilling boreholes and taking samples! Confidence that all data is complete and Eurocode compliant in line with the latest version of AGS. AGS data available immediately from site - no waiting for data to be typed into a useable format. GEOTECHCOURSE10OFFUse this Discount Code to get 10% off any geotechnical training course! Visit here to use the code. This code can only be used 5 times, so don't miss out! Project costing produced in real time giving accurate financial control. Creates a quicker and more efficient turnaround of logs and data allowing you to move on the next stage of your reporting process. Enables quicker scheduling of laboratory testing meaning you can get results in a timely manner. Enables rapid informed decisions and design changes according to the real-time data received from site. No delays due to re-scheduling or re-drilling due to lost/missing samples - everything is labelled and guaranteed to be legible. No re-writing anywhere - imports project details directly from office/client. No computer training required - just switch on and follow the instructions. No typing skills required - simple single entry of data directly on to screen. No pen required - uses latest touch screen technology. No writing of labels - prints thermal sticky labels from the bluetooth printer. No writing up of logs after shift - logs sent directly to office/client immediately. No scrabbling around for old note books - all projects are stored on the machine. No arguing over the final price - invoice is produced directly from the logs. 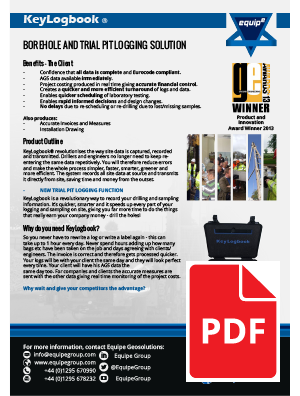 Ground Engineeering - Product and Equipment Innovation Award Winner 2013. Currently, KeyLogbook is being used on site every day by an ever growing list of companies who are reaping the benefits of using the technology - companies using the system include: Soil Engineering, ADP Group, Bridgeway Consulting, Ground Technology Services, plus many more. Borehole and trial pit digital logging solution. Trial Pit logging function included. 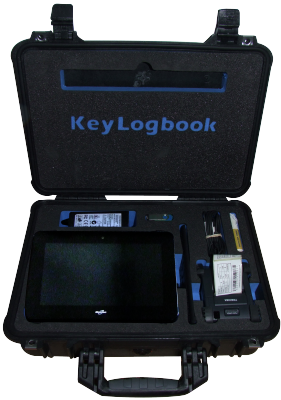 Interested in KeyLogbook but would like to sample the system before you purchase the full package? We are now offering the option of a free 30-day trial of the KeyLogbook program, available for you to use on your own device (devices running Microsoft Windows only).